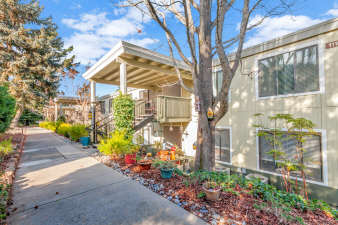 This lovely upstairs Sequoia coop is light and cheerful with pretty views of the Rossmoor's rolling hills from the large open balcony. Inside this two bedroom, one bathroom home is an open floor plan with a spacious living room and dining room that is open to the kitchen. The kitchen features updated cabinets, tile counters and white appliances. The bathroom has been updated with a new stylish vanity, stone counters and modern light fixtures and detailing. An inside washer/dryer makes laundry a breeze. The home is in move-in condition with fresh painting throughout. The carport is nearby and features a ton of extra storage. Don't miss this special property which is ready for you to move right in!